Last week, the Harker golf team traveled to Antioch to compete in the Gambetta Tournament, the longest running high school golf tournament in Northern California. The Eagles finished fourth – Harker’s best-ever finish at this tournament – behind Bay Area powerhouses Campolindo, San Ramon and De La Salle. Leading the way for the Eagles was Avi Khemani, grade 11, who finished in fourth place with a 2-under-par 70, the best-ever individual performance for a Harker golfer at this tournament. The highlight of Khemani’s day was a consecutive birdie, eagle, birdie on the back nine, to card a tournament low 31. Scout McNealy, grade 9, continuing the family linksmen tradition, shot a 1-over-par 73, finishing in a tie for ninth place. The Eagles travel to Corral de Tierra Country Club today to face Palma High School. The boys tennis team started its season with a 6-1 league win over King’s Academy last Tuesday. The Eagles then headed south over the weekend to compete in the California Tennis Classic in Fresno. After two consecutive years of strong finishes, the Eagles were selected as the only tournament team to move up two divisions, which matched them up with some of the best teams in the state. The Eagles went 1-2 on the weekend, with their sole win coming in dramatic fashion. 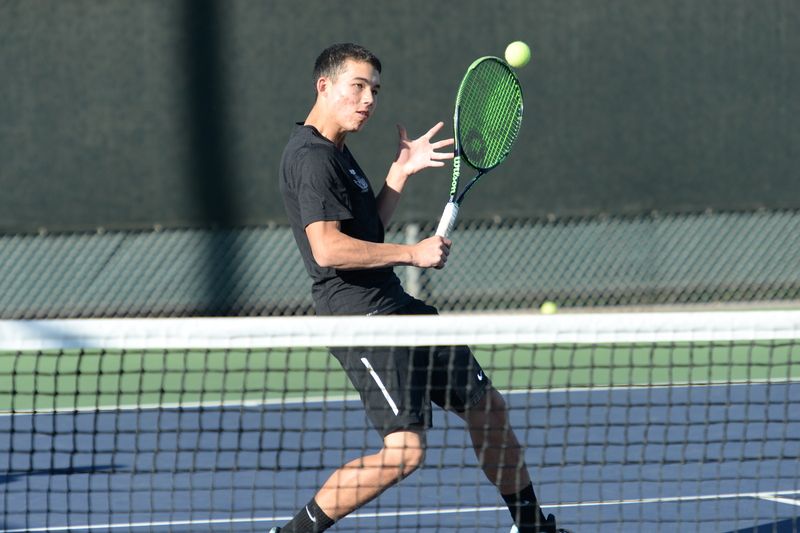 Harker upset defending Central Coast Champion Clovis West High School in the closest tennis match in both tournament and Harker history; it required three tie-breaking criteria and, ultimately, the winner of the No. 1 singles match to decide to winner. In the clinching match, Ronak Baldua, grade 12, overcame three match points before coming from behind to win 12-10 in a third set tiebreaker. Other strong performers included David Wen, grade 10, as well as the doubles team of Randy Zhao, grade 10, and Anjay Saklecha, grade 9. The Eagles travel to Pinewood on Tuesday to continue league action. Last week, the girls softball team traveled to Palo Alto High School and defeated the Vikings 10-5. Tong Wu, grade 12, led the Eagles with two hits and three RBIs. The Eagles will make up their contest with Menlo Atherton as their Friday match up was cancelled due to rain. Harker will host St. Francis Watsonville this Friday at Blackford. The boys baseball team picked up an 11-2 win over North Valley Baptist last week as Miles DeWitt, grade 12, had three hits and three RBIs to lead the way for the Eagles. However, Harker was defeated 6-2 by Crystal Springs Uplands in their league opener. Akhil Arun, grade 10, drove in two runs in the loss. The Eagles host San Mateo on Tuesday and travel to Jefferson High on Thursday. The track and field team was rained out this past weekend, midway through the Willow Glen Invitational. Before the event was shut down, Alycia Cary, grade 9, ran the seventh-fastest 800m, Elijah Edgehill, grade 12, ran the seventh-fastest 100m dash of the day and Anthony Contreras, grade 10, ran the 10th-fastest time. This Saturday, the Eagles will compete at the Kings Track Classic. The boys varsity volleyball team went 1-1 last week, losing to Oak Grove in five games. Andrew Gu, grade 11, led the Eagles with 14 kills. Later in the week, the Eagles traveled to Monterey High and came up with a three game win. Chris Gong, grade 9, led the way with 12 kills. The Eagles host Lynbrook on Tuesday at 6:15 p.m. at Blackford and host Amador Valley on Friday at 6:45 p.m. at Bucknall. The girls lacrosse team dropped three matchups last week, falling to Sacred Heart Cathedral and Gunn, before losing a tough 11-9 overtime loss to York. The Eagles will host Castilleja on Tuesday at 4:30 p.m. and Newark on Friday at 5 p.m. Even the rain and wind couldn’t stop the Harker swim team from competing this past weekend at the Monta Vista High School meet. Cedric Nowatzyk, grade 9, Ihita Mandal, grade 9, Karen Tu, grade 12, Anika Jain, grade 11, Philip Krause, grade 12, Alex Yu, grade 9, and Kevin Tzeng, grade 10, all swam personal bests at the event. Congratulations to Vivian Wang, grade 10, and Michael Auld, grade 11, who each had CCS qualifying times in their events. The Eagles are back in the pool on March 19 for the Small School Invitational at Sacred heart Prep.